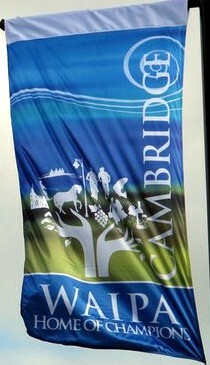 Cambridge is a town in the Waikato Region of New Zealand's North Island, located 20 kilometres southeast of the city of Hamilton. One of the region's largest centres, it has a population of around 15,000. The town is best-known in New Zealand as the centre of the country's thoroughbred horse racing, with many of the country's top stud farms located nearby. The usual sport’s fans flags are in horizontal stripes of red, yellow, black. Yellow, Red, Black are the colours that are used in regional sports uniforms, particularly those of rugby.